Each month, I'll be posting a new busy bag idea! Busy bags are a great way to keep your little ones not just entertained, but to encourage creativity and teach a little lesson along the way. I'm a fan of all things felt. Not just because felt is economical and easy to craft with, but also because I have a huge stash of felt. So any project that uses felt, I have very little out-of-pocket expenses. The original felt ring chain busy bag I saw involved Velcro. I'm not savvy in using Velcro, and I also didn't have any on hand. I changed up the design of the busy bag to suit my individual needs. First, draw out, using the ruler and chalk, lines on the felt where you are going to cut. 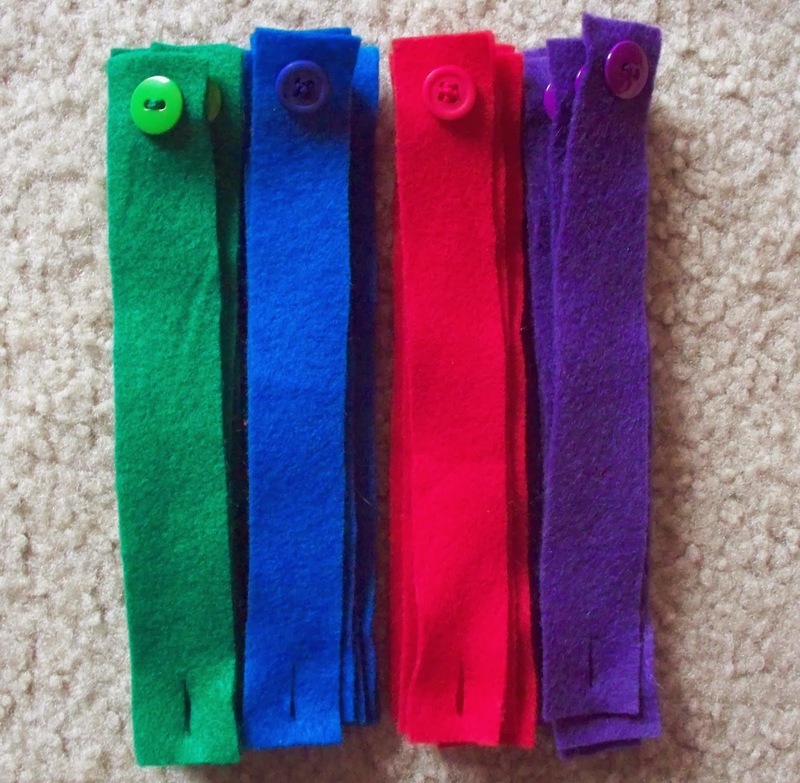 I made my felt strips one inch wide and seven inches long. 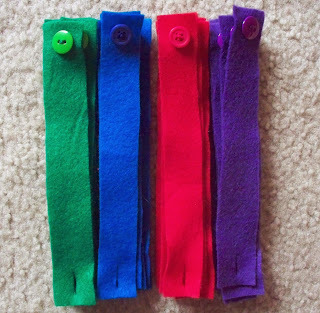 After cutting out all the felt, sew one button on each strip of felt. Sew the button near one end. After all the buttons are sewn on, cut a slit at the other end of the felt for the button to go through. Children can practice their fine motor skills and learn how to button by using this busy bag. The idea is to make a ring chain by buttoning all the strips together, like shown below. You can also customize this project further and include instruction cards in the bag. The cards could instruct the child to make a ring chain by using just green and red. 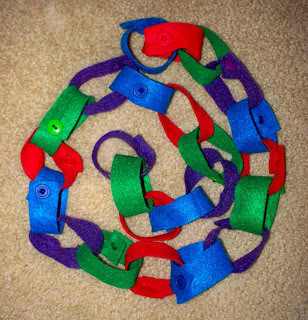 Or the child could be instructed to make a ring chain with all the green, then the red, then purple, then blue. That would help them learn colors. You could also make cards that instruct your child to make a ring chain by using 2 green, 3 red, 4 blue and 5 purple. This would help them learn colors and numbers. The possibilities are truly endless.